LAGUNA BEACH, CA -- (MARKET WIRE) -- April 4, 2007 -- Project BLUE is a new national initiative established for the sole purpose of raising more than $1 million in support of ocean and beach protection. With Earth Day approaching on April 22nd, we are reminded of the importance to initiate positive environmental change throughout the year, which is exactly what project BLUE sets out to do with the support of five leading surf brands. Industry leaders, Billabong, DAKINE, Electric, Nixon and Reef, have partnered to create limited and special-edition products for project BLUE. Each brand has committed to three years of support for the innovative new initiative which is taking a proactive approach to protecting the ocean. Set to launch in-stores in June 2007, these products will be sold at leading retail stores nationwide with a portion of proceeds going towards the Surfrider Foundation. "Project BLUE is not a charity; it's a plan of action," said Vipe Desai, project BLUE founder and Propaganda Headquarters president. "These brands make the ocean a priority. Generating monies to save the very thing that supports not only life, but also the spirit of surfing is a sound strategy." Products that will make up the project BLUE offering include Billabong board shorts, DAKINE backpacks, Electric sunglasses, Nixon watches and Reef sandals. Although each brand will retain category exclusivity, additional industry partners will be brought into the mix to build and strengthen the program in coming months. Event programs, media partners and additional industry support will soon be announced. Project BLUE was created in response to the decline of the state of the nation's coastal waterways and beaches and to help with their revitalization and protection for generations to come. According to the 2006 Surfrider Foundation "State of the Beach Report," research shows a gradual decline in water quality, over-development and beach erosion along our coasts. These issues continue to fatigue a natural resource that is essential to not only American popular culture and recreation, but the health and well-being of our surroundings. "Project BLUE will help to stem losses of water quality, coastal access and sand loss at beaches and surf spots across the country by supporting the community-based campaigns undertaken by the Surfrider Foundation's network of 60 grassroots chapters," added Jim Moriarty, Executive Director, Surfrider Foundation. To learn more about project Blue and how you can become part of the cause, please visit www.betruetoblue.com. The oceans, waves and beaches we love are being abused and need help. Through project BLUE, brands create unique products that help generate funding for Surfrider Foundation-based initiatives. The Surfrider Foundation is a non-profit grassroots organization dedicated to the protection and preservation of our world's oceans, waves and beaches. Founded in 1984 by a handful of visionary surfers, the Surfrider Foundation now maintains over 50,000 members and 60 chapters across the United States and Puerto Rico, with international affiliates in Australia, Europe, Japan and Brazil. For more information on the Surfrider Foundation go to www.surfrider.org. 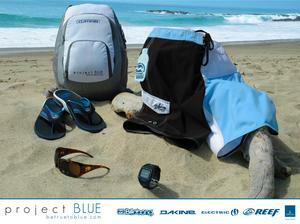 project BLUE partners: Billabong, DAKINE, ELECTRIC,<br> REEF, and nixon. For more information<br> visit www.betruetoblue.com.